I’m doing a pick up shift this a.m. and really needed an uplifting tea to get me moving. I usually grab a black tea most mornings but since I woke up before the sun rose I thought I’d be a little kinder to my mind and body. I just steeped a cup of White Spring Tea from TWG Tea and the Urban Tea Merchant. It was a perfect choice. I took my time popping the tea leaves in my strainer, warming my tea cup and settling into my seat with my White Spring Tea. The White Spring Tea is like a landscape that metamorphoses, bright and dewy, full of the magic of spring transforming the world with fresh silver tips of Yin Zhen white tea and fragrant cherry blossoms. White Spring Tea is a mild tea but can be steeped for longer without tasting bitter. I have a long shift ahead – looking forward to getting stuck in as usual with TWG Tea and the Urban Tea Merchant. This entry was posted in Uncategorized and tagged hot drinks, spa, tea, urban tea merchant, urbantea.com, wellness, white spring tea on April 9, 2016 by thirtyfourflavours. We are well into the New Year and I have been having a quiet but relaxing start. I’ve really taken time to check in with myself, do more reading, hitting the gym, eating better and sleeping. Man – you think that it would be an easy life. I can assure you – is it ever? My goal for the New Year is balance and taking care of me. Tea is always part of my quiet time. Especially tea from TWG Tea and the Urban Tea Merchant. My tea for January from TWG Tea and the Urban Tea Merchant is the ever chilled, French Earl Grey Tea. She’s as gorgeous as Provence in the summer. TWG Tea has created a fragrant variation of the great classic, Earl Grey. This black tea has been delicately infused with citrus fruits and French blue cornflowers. This entry was posted in Uncategorized and tagged french earl grey tea, hot drinks, new year tea, spa, tea, TWG Tea and The Urban Tea Merchant, wellness on January 13, 2016 by thirtyfourflavours. I’m on holidays and have been spending time with my feet up most days on the couch and a good book on the go. My tea of choice has been Rwanda Express BP1 Tea and Okayti Excellence SFTGFOP1 from TWG Tea and The Urban Tea Merchant. I like delving into the tea unknown sometimes and these two have been keeping me company and entertained like no ordinary tea would. A perfect indulgence for some extended time off. A most exceptional and exclusive TWG Tea creation. A rich and malty broken leaf black tea blended with the vigour of cracked coffee beans. The best of both worlds. I have been sucking this tea back with extra milk and sugar. I usually don’t go all out in my tea preparation but Rwanda Express BP1 Tea has all the makings of a fine estate coffee in a tea. Think rich, luxe and eccentric all rolled into one. Separated from Nepal by a simple stream, the Okayti tea estate, founded in 1888, harvests some of the most exquisite teas in the world for TWG Tea. The lush gardens are spread out over undulating terrain at altitudes of 1,300 to 2,000 metres. The first flush is eagerly awaited by connoisseurs each spring. This harvest boasts delicate pistachio-green rolled leaves which exude a pronounced flavour of mangoes, papaya and guava. A shimmering topaz-coloured infusion yields a buttery aroma with a round, mellow finish and boasts a lengthy aftertaste of grassy meadows and wild flowers. The preferred tea of Queen Victoria. This entry was posted in Uncategorized and tagged hot drinks, okayti excellence, rwanda express, spa, tea, twg tea, urban tea merchant on November 12, 2015 by thirtyfourflavours. Who needs international travel when you can sample the best in the world class cities with The Weekend Tea Collection from TWG Tea and The Urban Tea Merchant? TWG Tea, the world’s finest and most luxurious tea brand, invites you on an extraordinary private getaway with the launch of five new exclusive Weekend Teas to arouse vivid sensory escapes to the world’s most exotic destinations. The Weekend Tea Collection teas complement the first five teas in the range to create a cruise collection of ten distinctive TWG signature teas that offer an elegant and effortless retreat from the saturating heat of the summer sun. A dazzling juxtaposition of glamour and history, the Weekend Tea Collection invites tea drinkers to bask in the heat of the golden sun, drinking in the scent of red fruits and berries whilst wandering along the picturesque promenades of the Cote d’Azur with A Weekend in St Tropez, or to voyage to the summit of Victoria Peak with the grand mélange of green tea, wild rhubarb, blossoms and malty toffee of A Weekend in Hong Kong. Tea lovers and world travellers everywhere can now moor their thoughts and journey along the Grand Canal lined with glistening Venetian palazzos, journey on a voyage of the senses to the garden city of Singapore, or delight in the mystic memories of a cool night among the Dubai desert dunes, all in the privacy of their own teacups. This entry was posted in Uncategorized and tagged hot drinks, spa, tea, twg tea, urban tea merchant, weekend tea collection, wellness on October 25, 2015 by thirtyfourflavours. Shoppers at Holt Renfrew, Yorkdale can savor the exquisite specialty TWG Tea, the ﬁnest teas in the world, in a bright and airy tea shop reminiscent of old world/new world, located just inside the Holt Renfrew Yorkdale 1st ﬂoor. 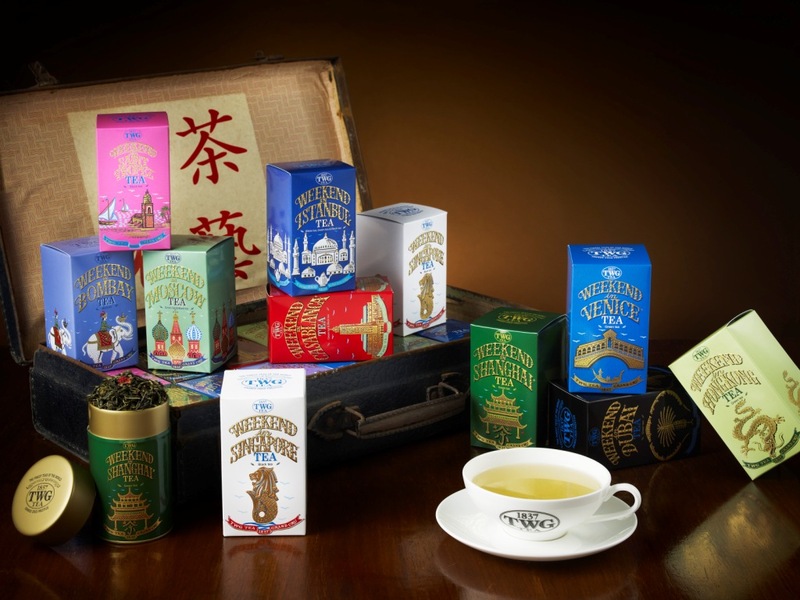 The Urban Tea Merchant is proud to be the exclusive distributors of TWG Tea in Canada. Toronto will be the second location in Canada for The Urban Tea Merchant to ofﬁcially retail TWG Tea in a stand-alone Pop-Up store. The pop up will feature a carefully curated selection of one-of-a-kind TWG Tea accessories and packaged teas to delight the eye and enliven the taste buds. With expert knowledge from The Urban Tea Merchant’s trained Tea Ambassadors, tea lovers will be able to select the perfect gifts for friends and loved ones. If tea preparation and service often seem steeped in tradition, stylish and timeless TWG Tea designs will certainly appeal to modern tea drinkers in their adaptation of tradition to the contemporary tea table. Elegant tea tins, a myriad of hand-blown glass, porcelain, stoneware and cast iron teapots, ﬁne bone china teacups, saucers, creamers and sugar bowls, as well as tea ﬁlters and tea scoops of all sorts can be found in TWG Tea’s accessory collection at The Urban Tea Merchant’s Pop-Up Store in Holt Renfrew, Yorkdale. TWG Tea also offers limited edition teas and seasonal blends, and is constantly sourcing, innovating, expanding and reﬁning the teas in its collection. Established at the epicentre of the world’s tea-producing region in Singapore, TWG Tea tasters assiduously ensure that their selection is always of the very highest quality, to maintain the consistency and freshness of each harvest. The pop up will open on July 16th and will operate during regular store hours at Holt Renfrew Yorkdale, until December 31st, 2015. This entry was posted in Uncategorized and tagged holt renfrew, holt renfrew yorkdale, hot drinks, http://www.urbantea.com, spa, tea, the urban tea merchant pop-up store, twg tea, urbantea, yorkdale mall on September 17, 2015 by thirtyfourflavours.